This article is a reply to some questions asked about the impacts of leaking deep water oil wells. 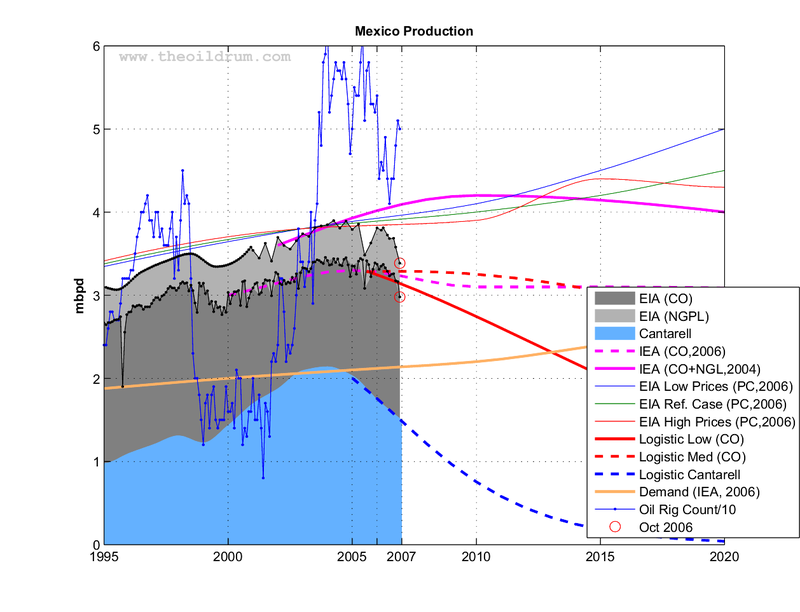 In response, we offer some points on Current, Past &amp; Future Issues with Oil Production in Mexico. The information presented exceeds what is needed to answer the questions, because we’re interested in kicking around the ball with folks with discussions on: the future of the Mexican economy &amp; the future of the Peso – and these topics hinge heavily on Mexican oil production. Back in the day, I was an oil field worker here in Ohio, little wells, under 6000 feet in general. But even then we had our share of blow-outs, nasty things that could kill you if you were a slow runner. We had blow-off protection valves on those rigs but they almost never worked-gas everywhere! The drilling mud would start spitting up, then the ground would start moving a bit( I would be running for my life at this point) and then there would be gas everywhere down wind from the rig. One spark and we would have a rig fire, 14 million dollars worth of rigging up in smoke would be the end result. The process of killing a blow-out was not good. If it was on fire, we would wait it out as it would blow off pretty fast, a week or so at most but if it was not on fire the owners would want to save their rig and we would have to kill the blow out. The process involved putting a new valve on top of the well head and pumping cement down the hole to plug off the gas pocket, getting the valve on the well head was pretty scary. You were in the gas stream hoping that there was no steel on steel contact of the sort that would make a spark, what with the valve and the wellhead being made of steel and they had to be joined. All of this under the drilling deck in knee deep mud. I was so happy when the steel mill called me back to work.